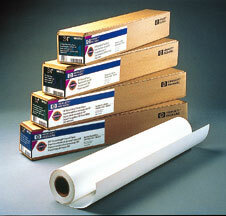 An economical alternative to vellum for reproducible drawings check prints. Translucency and dense blacks make it ideal for diazo and xerographic reprints. HP DESIGNJET WHITE BOND PAPER 36 X 300 FT.
HP DESIGNJET WHITE BOND PAPER 36 X 150 FT.
HP DESIGNJET WHITE BOND PAPER 24 X 150 FT.